G Adventures, the world’s leading adventure travel company, has announced the second winner of its hugely popular UMI (or Über Massive Incentive), surprising the lucky winner in store last week with a tour prize for him and a friend. 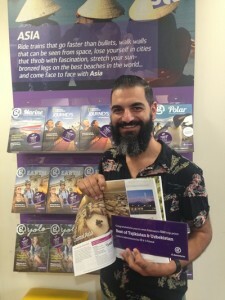 Jake Cassar, from STA Travel, University of Melbourne, won two places on G Adventures’ Best of Tajikistan & Uzbekistan after being chosen at random from bookings made during February. There are still two adventures up for grabs for Australian and New Zealand agents, including the major prize drawn at the end of the promotion, a trip to Antarctica for an agent and one friend, including flights with Air New Zealand. Alongside weekly prizes including GoPro packages, Mountain Design vouchers and National Geographic subscriptions, agents can still win a nine-day adventure in Japan. All agents have to do to enter is confirm a G Adventures tour booking before 31 March 2016. The more bookings confirmed the more entries an agent receives in the draw. G Adventures Managing Director for Australia and New Zealand, Adrian Piotto said he was excited to be rewarding hard-working agents with the very adventures they sell everyday. “It’s so exciting to see our agents jetting off on well-earned adventures overseas and there are still so many prizes to be won. All agents have to do is confirm one booking and they could be on the trip of a lifetime to Antarctica,” he said. Winners will be announced each week until 8 April through G Adventures’ UMI newsletter. Agents must be registered with G Adventures’ sales platform, Sherpa, to be in the running. Agents can also join the UMI Facebook group for updates and the opportunity to win spot-prizes.